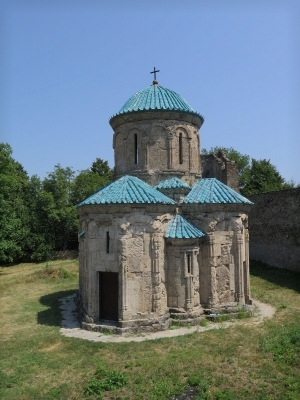 Kvetera Church is part of the Tentative list of Georgia in order to qualify for inclusion in the World Heritage List. Be aware that getting to this place is not easy. The rental company will most likely already forbid you to drive on the unpaved 843 road anyway but if you are like me and defy them then make sure you have a 4WD. Also if you look at the map you will see a "shortcut" which is even advised by Google navi... DON'T. This is just a collection of large boulders forming a downhill sort of path. You will damage the car for sure. In fact there are a lot of these "shortcuts" not marked on google you would never think about taking but apparently this one got added to the map at one point. Drive along the normal 843 gravel route towards the driveway leading to Kvetera Fortress. Got a 4WD? Then you can actually drive all the way up this narrow road. If not then I doubt you will make it and, again, like me, have to reverse down and park it along the grassy patches. Walking up the rest doesn't take too long and I would have done earlier knowing the issues up ahead. Anyhow, so you FINALLY made it up there, yay! The fortress is basically just a collection of walls now. There is one building left standing without a roof. The main attraction is the tiny cute church though. The roof is well maintained and even from the outside it looks adorable. The listing is trying to get it inscribed for the architecture but I want to say good luck with that. You can hardly see that. Inside (should be open) is indeed not decorated at all. The gray walls will not impress you much. There isn't much else to do up here but I found a ladder leading up to the walls and you get a really nice view of the surroundings.